The English Foxhound is an athletic hunting dog developed by crossing hounds with the Bulldog, Greyhound and the Fox Terrier hence the name being a combination of the founding dog breeds. I originally thought the English Foxhound breed was an old breed however it only started being standardized in the mid 1800’s. Their skill set includes hunting, tracking, watchdog and agility, though due to their large size their lifespan is less than 10 years, and around 7 for reasonable working ability. This is less than the American Fox Hound derivative. 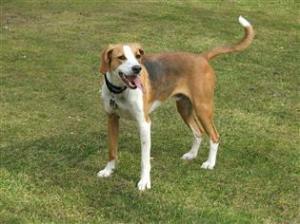 While relatively new, the English foxhound has not been substantially developed from its early days. I personally find this very refreshing. Rather than hone, adapt and continually fidget with a great hunting dog, the dogs hunting ability remains essentially pure. That means it is as much up to the hunter to get the best out of this breed, rather than buying one per-packaged that has little need for training .. (though with any great hunting dog, training is always required). This non meddling with the breed, has meant that the English Foxhound is not considered as easy to train as other dogs or specifically hunting dogs, so if patience and ability to work with intense dogs is not your style, you may consider other dogs like the American Foxhound. These hounds are considered friendly with people children, and most other dogs (because of their strong pack hunting abilities) they should not be left alone with any other family pets. Their specialty is their ability to run at a good speed for up to six hours without stopping. Amazingly some websites state that a detraction is that this breed can become destructive without appropriate exercise. This is a raw hunting dog and should not be kept in an apartment, in the city or for any purpose other than hunting, unless you are willing to do a lot of training and Long runs EVERY day. There are two main English Foxhound types: field lines and show lines . The Field lines are bred for hunting and field trial work while the bench style is bred for conformation shows. The main difference that most text give between the English Foxhound and the American is that the English is stockier and slower and a slightly less developed sense of smell for tracking. Please consider the needs of this dog before adopting them from shelters or trying to conform them to an urban lifestyle. This entry was posted in Dog Hunters, Scent Hound.